Please join us for a night of fun while raising money for a great cause! This quarter auction will be held at the Pavilion of the City of Marion on Friday, March 1, 2019 from 6 pm to 9 pm. The doors open at 6 pm and the auction starts at 7 pm. All proceeds raised at this event will be donated to Kre8ive Fine Arts Academy. There will be a variety of auction items including merchandise from local vendors, gift cards, gift certificates, and much more! There will also be items raffled off, with raffle tickets being sold at the event. Admission tickets are $5.00 each and one bidding paddle to use in the auction is included with your admission ticket. You must bring quarters to use with the bidding paddles to bid during the auction. There are a limited number of tickets available. You may also purchase an "all in" paddle at the door for $25.00, which is a paddle that gives you one chance to win every item that will be given away in the auction. Admission tickets can be purchased online at www.eventbrite.com or from a Kre8ive member. There are a limited number of tickets available, so get yours before they sell out! There will be several vendor booths set up with local businesses selling and showcasing their products and services. The Wooden Spoon Catering will have food available for purchase and Ella's Umbrella Cupcakes will have cupcakes for sale, so come hungry! We are joining in this great reading event this year! We will be reading books throughout the day, approximately every 30 minutes!! We will also have coloring pages, bookmarkers, and word puzzles. Come join us for a fun filled day of books, reading, and arts & crafts!!! We will be reading books geared for approx. ages from 3-11. I'm coming back in town! Catch me at Walker's Bluff!! The SIH Talent Acquisition Team cordially invites you to attend a resume and interview workshop for current employees and community members interested in pursuing employment at Southern Illinois Healthcare. Learn how to effectively highlight your knowledge, experiences and abilities on your resume and during interviews. During the workshop we will discuss and provide examples of the hiring process. All are welcome to attend. Must RSVP to prior, as space is limited. We hope to see you soon! Prepare to give the gift of experience on March 6, 2018. On Wednesday, March 6, SIU is hosting its annual Day of Giving – a 24-hour online giving campaign. We hope you will join us and make a special gift on #SIUDAY. GIVE: All SIU alumni, parents, students, faculty, staff and friends are challenged to show their support for our wonderful institution. All gifts made online between 6 a.m. March 6th, and 6 a.m. March 7th, count toward the Day of Giving. Bookmark this website to make your gift in support of SIU on March 6th! SHARE: Spread the word about #SIUDAY of Giving. Post on Facebook, Twitter, Instagram and LinkedIn to share why you give back to SIU. Make sure you use #SIUDAY to see your content on the Day of Giving social media wall. ASK: Ask your personal network to join you in making a gift! Want to create a Challenge Fund? We’d love to hear from you! Contact Matt McCoy at matthewm@foundation.siu.edu. Meeting of the Sister City Committee. Agenda will be emailed out to committee members. For questions, contact the chamber office. Are you looking for a FUN summer job?! Well, Rent One Park will hold WEEKLY job fairs on Wednesday starting January 30th until March 27th, 4pm to 6pm in the Diamond Club. Please come prepared to interview and have a completed application that can be found on our website. Come try new items and meet our Chef! On Wednesday, March 6th at 6pm we will be offering a "Test Kitchen" dining experience at the Tasting Room. We are trying out new items and want YOUR feedback to see what will end up on our menu! Our team will be preparing 12-15 items for you to try and you can tell us what you want to see in our Tasting Room for the Spring. To ensure that we prepare enough food, we are charging a small fee of $7.50 ($9.58 with Eventbrite fees). We will have tickets available for purchase at https://wbtestkitchen.eventbrite.com until Sunday, March 3rd. We hope to see you there! As part of the 2019 Sister City visit, we will be having activities that center around Japanese culture. The first event will be a workshop on Kumihimo braiding, a Japanese braiding technique for jewelry making. Our bracelets feature two colors, you have a choice between blue, gold, white, and green. 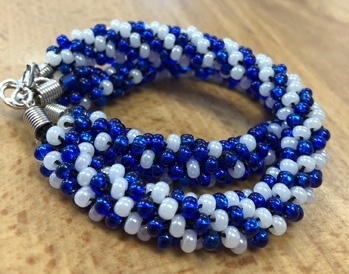 Join us for a fun evening of bracelet making with Elaine Ketring on Thursday, March 7, 2019 from 5:30pm – 7:30pm. A fee of $5.00 will cover the cost of materials for one bracelet. The class is limited to 20 people, so hurry and sign up today! The film screening will be followed by a panel discussion with area educators, officials and healthcare providers who are part of the national discussion to prevent childhood trauma, treat toxic stress, and greatly improve the health of future generations. Continuing Medical Education (CME) credits are also available to qualifying medical professionals for a $50 fee (payable upon admission). Seating is limited and RSVP’s are encouraged. To reserve your seat please visit: https://resiliencepanel.eventbrite.com. For more information, contact Prevention Specialist Brittney Hale at 618.993.7122 or bhale@pacillinois.org. Street Smart Saves Lives // Real Responders. Real Stories. Street Smart Saves Lives. Presented by experienced firefighters/paramedics, Street Smart is a real life program that dramatically demonstrates the consequences of poor choices such as underage drinking, drunk driving, drug abuse, eating in the car, texting and talking on the phone while driving, and not wearing seat belts. Come learn how it pays to be Street Smart. This spring, Wacoal invites you to join us in Fit for the Cure® to help us contribute to Susan G. Komen’s Bold goal to reduce the current number of breast cancer deaths by 50 percent in the U.S. by 2026! When you receive a complimentary bra fitting from a Wacoal fit specialist, Wacoal will donate $2 to Susan G. Komen® and another $2 for every Wacoal or b.tempt’d item purchased that day to benefit breast cancer research and health programs. 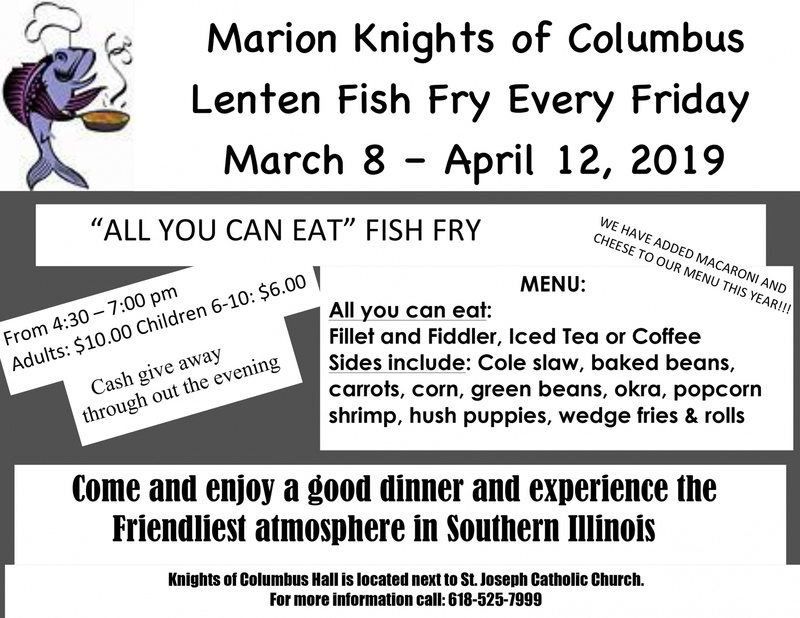 Join the Marion Knights of Columbus for their annual Lenten Fish Fry every Friday from March 8th to April 12th. All you can eat Fillet and Fiddler, Iced Tea or Coffee. Sides include: Cole Slaw, Baked Beans, Carrots, Corn, Green beans, okra, popcorn shrimp, hush Puppies, Wedge fries & rolls. The Marion Chamber of Commerce Monthly Membership Luncheon will be held on Tuesday, March 12th at The Pavilion. Lunch service begins at 11:45 a.m. This month's presentation topic is about the ongoing Sister City partnership between the City of Marion and Kanie Town, Japan. This month's lunch will be provided by Great Boars of Fire. Menu Caesar salad, Meat Lasagna, Garlic Bread & Assorted Cobbler. Specialized Equine Services is the sponsor of the this month's Monthly Membership Luncheon. Meeting to discuss 2019 Chamber Golf Events. Agenda will be shared with the committee beforehand. IT Day 2019, the largest technology conference in Southern Illinois, returns to SIU Carbondale on March 14, 2019. Be sure to SAVE THE DATE! This year’s theme, Driving Success with Technology, revolves around our rapidly changing world—a world in which individuals, educational institutions, government entities, and businesses must creatively embrace advanced technology tools to achieve success. This is your opportunity to engage with them. It is not an event for selling tools--it is an event to sell your expertise, your ideas, and your professional reputation. Sponsor the day, sponsor a session, present a topic, or look for great employees in our technology-focused career event (for students). The event is FREE to attendees—that’s why we need sponsors! Space is limited—reserve it today at https://itday.siu.edu! Have questions, contact Rodney Emery (618)453-6212 or remery@siu.edu. -Come and join our organization, and become part of the Hospice of Southern Illinois’ team, as a Volunteer. We are a community-based, not-for-profit hospice helping patients and families in Southern Illinois. End-of-life care provided by those who care about Southern Illinois. -PSVP to Donna or Rita, 618-997-3030. MMH Spring Open House & Sweet Tea Day! Come shop all of our new spring arrivals & receive 10% off your entire purchase! We will have lots of new arrivals! The Marion Chamber of Commerce Sister City Committee will meet at the chamber office. Agenda will be sent to committee. fatigue and vicarious trauma and how both affect the body and mind. By attending, LPC, LCPC, LSW and LCSW licensed staff members will be eligible for CEUs. Attendees without these licenses will receive a certificate of attendance. 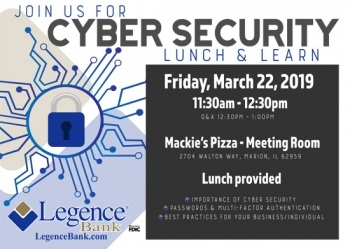 Join Legence Bank on Friday at Mackie's Pizza for a Lunch & Learn focused on cyber security, passwords, authentication, and best practices for your business! Enjoy a complimentary lunch and network with other business professionals. Join us for a special Grand Re-opening Open House at Reynold's Exteriors & Coatings to celebrate their new location. The open house is all day with a ribbon cutting at noon. 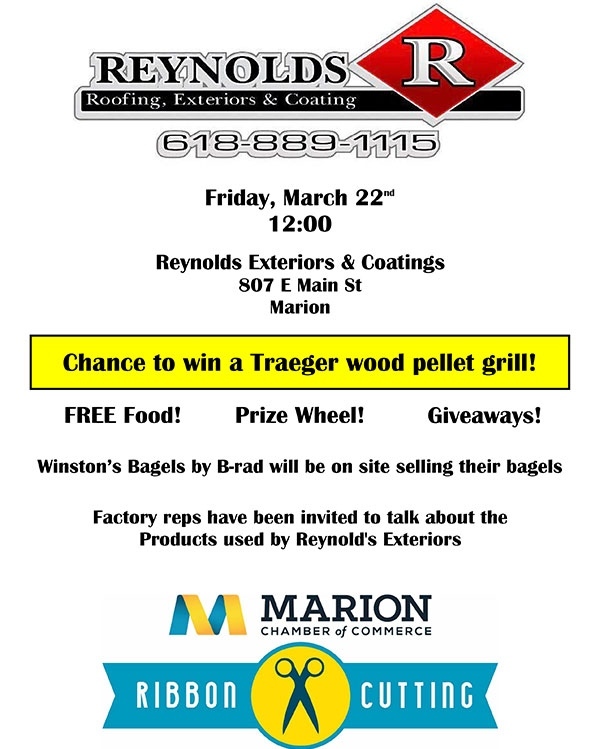 Enjoy free food, spin the prize wheel, enjoy giveaways, and a chance to win a Traeger wood pellet grill! Winston’s Bagels by B-rad will be on site selling their bagels. Factory reps have been invited to talk about the products used by Reynold's Exteriors. 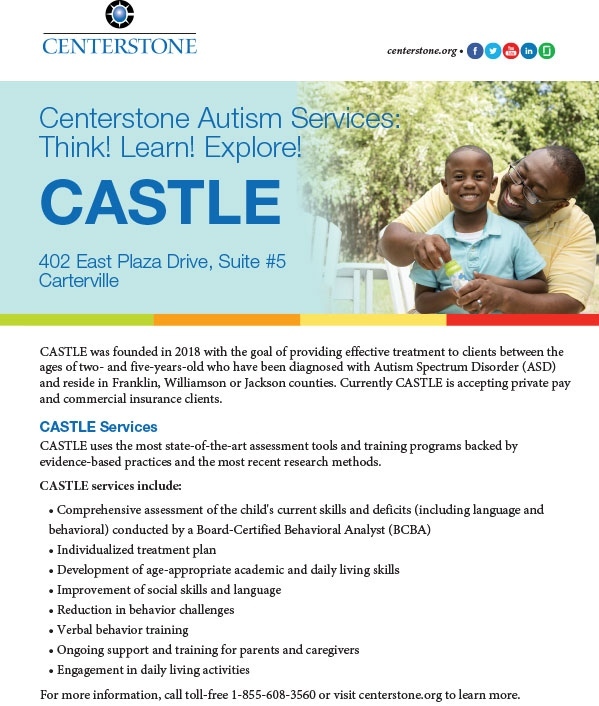 Centerstone, a national leader in behavioral health care, will host a ribbon-cutting celebration and open house on Friday, March 22, to commemorate the official launch of Centerstone Autism Services: Think! Learn! Explore! (CASTLE), an intensive, evidence-based therapy program for children between the ages of two- and five-years-old who have been diagnosed with Autism Spectrum Disorder (ASD). The ribbon cutting will take place at 4:30 p.m. The open house will be held from 4-6 p.m. Everyone is invited to attend. Applications for Veterans for Flight 005 are due on March 22. Sister City Cultural Exchange 2019: Welcome Party Pot Luck! Join us as we welcome our 2019 delegation with an All American Pot Luck dinner at 5pm on March 23rd at The Pavilion. Please bring a covered dish or dessert to share! Please call the office 997-6311 or use the link below to let us know you're coming and what you will bring! Join us for a great one man show with music and stories from the 50's and 60's! $5.00 cover per person. No reserved seating. The club opens at 1:00pm on Saturdays. This month's Lunch & Learn will be held on March 27th from noon - 1 p.m. at Heartland Regional Medical Center, Classroom 1&4. 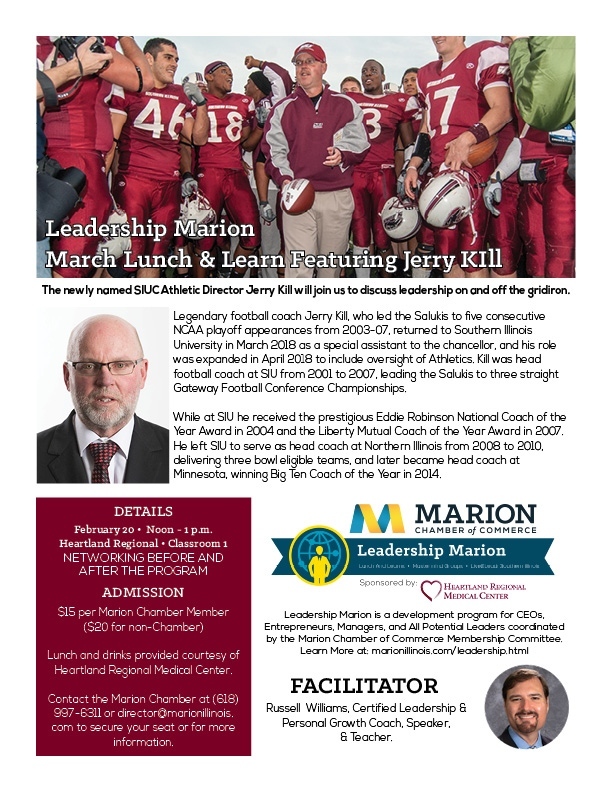 This Month's Topic: The newly named SIUC Athletic Director Jerry Kill will join us to discuss leadership on and off the gridiron. University in March 2018 as a special assistant to the chancellor, and his role was expanded in April 2018 to include oversight of Athletics. Kill was head football coach at SIU from 2001 to 2007, leading the Salukis to three straight Gateway Football Conference Championships. While at SIU he received the prestigious Eddie Robinson National Coach of the Year Award in 2004 and the Liberty Mutual Coach of the Year Award in 2007. He left SIU to serve as head coach at Northern Illinois from 2008 to 2010, delivering three bowl eligible teams, and later became head coach at Minnesota, winning Big Ten Coach of the Year in 2014. You’re Invited to the Davie School Inn, Anna IL for the Annual Regional Tourism Industry Brochure Exchange! J oin us as we celebrate the official ribbon cutting of Lavish's Marion Square location and a 3rd Anniversary celebration! Enter for great promotions and giveaways. Enjoy food by Pookies! Inflatable Fun and The HUB Recreation Center are teaming up again for our Third Annual Bash for CASA of Williamson County!